Product prices and availability are accurate as of 2019-04-21 14:15:43 EDT and are subject to change. Any price and availability information displayed on http://www.amazon.com/ at the time of purchase will apply to the purchase of this product. Why settle for a standard portable phone charger when you can own a NVR DEAD solar phone charger that provides power anywhere in the world when you need it most! Keep you and all your friends on the go with this portable solar charger ! When your power bank absolutely MUST have power... Use NVR DEAD solar cell phone charger for emergencies & everyday use! - Press side power button once to reveal 4 solid blue lights indicating charge level. - Fully charge portable charger from wall outlet or computer for fastest results. - During USB charging, flashing blue light indicates portion currently charging. - Solid Green light indicates the solar panel is receiving light. When in strong, direct sunlight it receives a slow trickle charge of 200mA/hr. 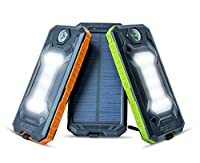 NOTE: Solar panel is designed for emergency situations to provide enough power to place a call or send message with your iPhone or Android phone, and not to fully charge your solar power bank. - To turn LED lights on/off, double click the power button. ~ THIS SOLAR CHARGER COULD SAVE YOUR LIFE! Whether you're on the go in the city, enjoying the outdoors, or stuck in a survival situation... that dreaded moment when you're all out of battery and NEED to make a call or send a message is soon to be a thing of the past! 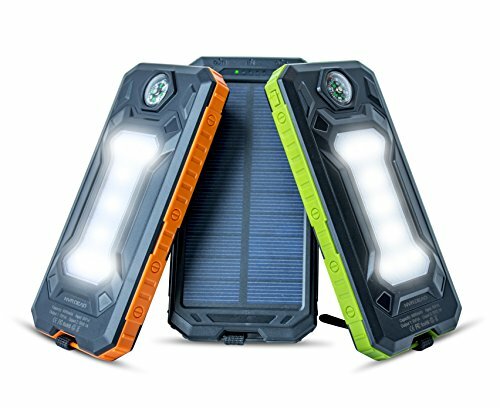 When other Portable Chargers drain... NVR DEAD Solar Power Bank keeps you going in the most extreme conditions. ~ MULTI USE - Rugged battery pack built for everyday portable charger use, and designed for survival & emergency situations where you absolutely MUST have power. Gift one for all of your loved ones to keep in the car, purse, home, office, and emergency preparedness bags. Now everyone can enjoy powered devices at home, on the road, or experiencing your favorite outdoor activities. ~ CONVENIENT DESIGN - Your NVR DEAD Solar Charger looks stylish but it is also designed for convenience. Compact enough to fit in any pocket, & big enough to power multiple devices using the Dual USB ports. This Portable Charger's super bright LED's give you more lights without draining your phone's battery. 8,000mAh is perfect portable charger capacity- Enough to charge multiple devices (iphone7 up to 4x) & low enough to quickly recharge your solar power bank to keep your life on the go! ~ 100% MONEY BACK + FREE BONUS - We believe in the quality we offer with each Battery Pack so much we'll give your money back if you're not fully satisfied. Each solar charger has rigorous quality process to ensure safety and quality for you to enjoy. Plus you can feel great about your purchase, as a portion of every sale goes towards helping Hurricane Victims. You also get a FREE carabiner & strap to conveniently attach to anything. * NOTE Free carabiners available while supplies last. ~ WARNING - Most Portable Charger sellers put a higher mAh capacity on battery pack to fool you (e.g. real 8,000mAh but print 10,000mAh) Avoid cheap knock-off power banks with false capacity, trust you're getting a full quality 8,000mAh. ALSO NOTE: Solar Charging designed for emergency situations & not for full charge w/ sun only. Get peace of mind knowing that when regular power bank is dead, your NVR DEAD Solar Charger will still provide energy to revive your device to place call or message.